Car Shopping? 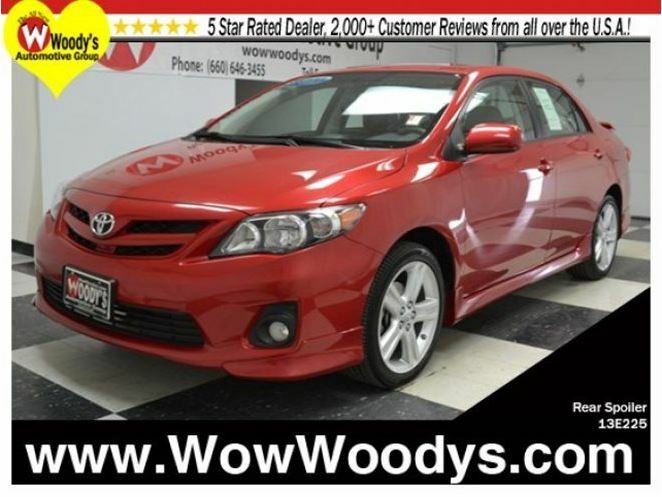 Take a look at this 2013 Toyota Corolla S for sale Greater Kansas City area! 2013 Toyota Corolla FWD 1.8L I4 Sunroof, CD Stereo w/Aux, Alloy Wheels, 34 MPG, Rear Spoiler, Bluetooth Streaming Audio, Certified Warranty. Come to Woody’s Automotive Group! You NEED to see this car! If you want an amazing deal on an amazing car that will not break your pocket book, then take a look at this fuel-efficient 2013 Toyota Corolla. Why take the bus, when this can get you there so much more conveniently and comfortably? Such great gas mileage that you’ll spend about as much on gas as you would have the bus fare! We will pick you up at the airport or ship your vehicle to you! If you’d like more information about this luxurious used Toyota Corolla our huge selection of other used Toyota or 700+ vehicles located near Kansas City please visit our website and provide us with your contact information. One of our empowered Woody’s Automotive Group Sales Advisors will contact you promptly.